Antwerp (Antwerpen, in Dutch, Anvers, in French), the second largest city of Belgium and a major port and industrial center, is the home of the second largest Jewish community of Belgium and one of the most observant Jewish communities in Western Europe. The first Jewish presence in Antwerp is attested to by the will of Henry III, the Duke of Brabant and Margrave of Antwerp who in 1261 expressed his wish that the Jews of Brabant should be expelled and destroyed because they are all “usurers”. His widow, the Duchess Adelheid, took a more practical view and asked for the advise of the greatest Catholic theologian of the time, Thomas of Aquinas that formulated his response in a tractate later known as De regimine Judaeorum (“On the status of the Jews”). According to Thomas Aquinas’s reply to Adelheid, the Jews should be encouraged to make a living from other occupations than money lending. A document of 1286 mentions the name of a Jew living in Antwerp: Daniel Judeus (Daniel the Jew), a wine merchant, moneylender and magistrate at the Jewish law court who came to Antwerp from Cologne (Koeln), Germany. In 1292, the Duke of Brabant John I granted a charter to the city of Antwerp in which the Jews are listed among the inhabitants of the city. It is possible that some of the Jews who were expelled from England in 1290 and from France in 1306 settled in Antwerp that by then was on a process of becoming an important commercial city. Apparently the small Jewish community of Antwerp continued to exist during the first half of the 14th century, but the anti-Jewish persecutions that followed the Black Death epidemic of 1348, when Jews were accused of poisoning the wells, put an end to the Jewish settlement in Antwerp. Jewish sources, especially the Memorbuch of Mainz and also that of Deutz record among the dead during the anti-Jewish riots and persecutions in Brabant also the victims of Antdorf, the German name of Antwerp. Although there is no direct evidence about the fate of the Jews in Antwerp, it is safe to assume that they could not have continued to reside in that city after John III, the Duke of Brabant, conducted a massive anti-Jewish campaign in Brussels and Louvain during the mid 14th century. A new group of Jewish immigrants started to settle in Antwerp in the early 16th century when the city became a relatively safe heaven for crypto-Jews fleeing the persecutions and the expulsions in the Iberian Peninsula. The growing commercial importance of the city, bolstered by the international maritime trade to the newly discovered American continent and the declining traditional economies of other cities in Flanders, could only attract Jewish merchants from Spain and Portugal as well as from other parts of Europe, who arrived in Antwerp later on in the 16th century. An edict of 1526 by the Emperor Charles V guaranteed a safe-conduct for the Portuguese New Christians in Antwerp. Although under Spanish rule, the Inquisition was not allowed to activate in Antwerp, a situation that facilitated the settlement of crypto-Jews from Spain and Portugal. The commercial connections that the Portuguese crypto-Jews maintained with their former country enabled them to have a share in the lucrative Portuguese monopoly of the spice trade with India and the Far East. The general attitude of the Spanish authorities did not permit overt practice of Judaism and indeed from time to time several crypto-Jews were tried under the accusation of being pseudo-Christians and conducting illegal trade relations with the Ottoman Empire. The most famous trial (1532) was conducted against Diogo Mendes (before 1492-c.1542) followed by a posthumous process against him in which the Spanish authorities aimed to prove that he was not a sincere Catholic and consequently to confiscate his estate. Antwerp was also the home of Beatrice de Luna later known as Dona Gracia Mendes Nasi (1510-1569), a sister-in-law of Diogo Mendes and wife of Francisco Mendes (d.1536). She lived in Antwerp from 1536 until 1549 when she fled to Venice, Italy, and then to the Ottoman Empire. Her nephew, João Miguez, better known as Don Joseph Nasi (1524-1579), was also a resident of Antwerp. Having been arrested in 1549, he too left for the Ottoman Empire where he eventually became Duke of Naxos. Other famous crypto-Jews who resided in Antwerp during the 16th century include the physician Amatus Lusitanus (d.1568) who lived in Antwerp from 1533 to 1540, when he was invited to the French court. The Spanish policy took a turn for the worse in 1543 and again in 1550, when probably all crypto-Jews were forced to leave Antwerp, despite strong opposition from the local municipality. It appears, however, that members of the “Portuguese nation” – a generic name that included New Christians from the Iberian Peninsula, several of them undoubtedly crypto-Jews, continued to reside in Antwerp in the second half of the 16th century. They were encouraged by the Calvinist Reform that was spreading in the Low Countries and became very popular in Antwerp too. But towards the end of the 16th century the conflict that developed between Spain and the people of the Low Countries turned into open war. Antwerp was recaptured by the Spanish troops in 1585 who then introduced an intolerant policy favoring the Roman Catholic Church with the effect that the Protestant inhabitants of Antwerp and probably most of the crypto-Jews fled to the Northern Provinces and particularly to Amsterdam. While in 1571 there were 85 families belonging to the Portuguese nation in Antwerp, their number declined to 47 in 1591 while a list from 1619 mentions 46 names and another one from 1666 gives 65 individuals. It is possible that some clandestine synagogues functioned occasionally in Antwerp. A report of the Inquisition of Lisbon contains a list of the worshipers of the synagogue in Antwerp in 1585. In 1565 Christopher Plantin (1514-1589) fled the Catholic censure in his native France and opened a printing-press in Antwerp that during following twenty years produced a number of important Hebrew books. Even though for the most part rejected by the Jewish rabbinical authorities of the time, Plantin’s Hebrew editions of the Bible helped to geminate and encourage a new interest in the biblical and Jewish studies among the non-Jewish intellectuals of the early modern times. The Peace of Westphalia (1648) made possible for some crypto-Jews to return to Antwerp. However, they could not enjoy freedom of religion, and continued to be targeted by the Inquisition. Protocols of trials by the Inquisition in the Canary Islands during the 1660’s contain testimonies, sometimes taken under torture, according to which there were crypto-Jews in Antwerp who maintained various Jewish costumes and relationships with Jews in other countries, especially with the Jews of Amsterdam. In the early 1670’s the bishop of Antwerp Ambrosio Capello complained to the Archduke of the presence in Antwerp of insincere Catholics whom he suspected of being crypto-Jews. There were rumors about Jewish prayer books having been printed in secret in Antwerp as well as the existence of clandestine synagogues. In 1682 the municipal authorities discovered a secret synagogue that was frequented by members of the Portuguese nation. When another secret synagogue was discovered in 1694, Elijah Andrada, one of the local crypto-Jews, took the matter to the courts demanding the restitution of the property confiscated in the name of the King of Spain. The Treaty of Utrecht (1713) transferred Antwerp to the Austrians. The new authorities were more interested in collecting their taxes than in enforcing anti-Jewish policies. Although in principle there were limits on the number of Jews permitted to enter the country, after 1718 they were required to pay the Toleranzgeld, a special tax for the right to reside in Antwerp. The first Jewish inhabitant that was inscribed in the Poorterboek (the municipal register of Antwerp) was Abraham Arons, a shopkeeper, in 1715. Other Jews originally from Amsterdam or Germany are mentioned in the municipal records of the early 18th century. During the reign of Maria Theresia (1740-1780) the situation of the Jews was again unstable. Jews are mentioned in many cities in the region, including Antwerp, from 1745 to 1748, when the Low Countries were temporarily occupied by the French. The economic decline of Antwerp resulting from the closing the River Scheldt, forced the city magistrates to endorse a consistent policy of encouragement of the commerce, including tolerating the settlement of Jews in the city. Sometimes this attitude brought them in conflict with the Austrians. During the second half of the 18th century there were a number of attempts by Jews to obtain citizenship, but they were strongly opposed by the city council. As early as 1769, Abraham Benjamin, a Jew of London who conducted an important trade with the Flanders applied for citizenship of Antwerp, having moved to the city. Fearing the concurrence, the city authorities accorded him the citizenship with the condition that this decision should not serve as a precedent for other Jews. New requests for citizenship followed from Jews who came to Antwerp from Amsterdam and from Germany, but not all were answered positively. The general situation of the Jews improved during the reign of Joseph II (1780-1790), particularly after the publication of the Toleranzpatent of 1787. In 1794 Antwerp was captured by the French revolutionary army and remained under French administration for the subsequent twenty one years. Under French rule, Jews could settle freely in Antwerp for the first time. Whereas the French Revolution granted full citizenship to the Jews living in French territories, the administration of Napoleon I intervened into the internal affairs of the Jewish community. Following the French model, all Jews of Belgium were organized into a Consistory. Because during the 1800’s there were only about 800 Jews in Belgium, they all were annexed to the Consistoire of Krefeld, in Germany. In 1808 the Jews of Antwerp were accorded three months to adopt a family name and change their traditional Jewish given names to local names. The municipal records preserved the names of 36 Jews of Antwerp, the great majority born in Holland. With a few exceptions, they all changed their names and adopted vernacular, mostly French names. At the end of the Napoleonic wars, Antwerp was incorporated into the Netherlands. All religions, including Judaism, were granted equality. Jews from the Rhine districts as well as from Holland started to settle in Antwerp. From the administrative point of view, the Jews of Antwerp were subordinated to the Jewish community of Brussels. The Jewish community of Antwerp was officially established in 1816, when there were about one hundred Jews living in the city. This first legally recognized community was known as the Jewish Community (Communaute Israelite) also called the Dutch community. It continued to exist as a separate body until 1931, when it merged with the Jewish Community Shomre Hadas. The first Jewish public prayers were held in the private home of a certain Moise Kreyn, having received the approval of the city authorities. The Jews of Antwerp acquired possession of a cemetery in 1828. There were 151 Jews in Antwerp in 1829. Antwerp became part of the independent Kingdom of Belgium in 1830. During the 19th century the Jewish population of Antwerp augmented considerably: from about 100 individuals in the late 1810’s to around 500 in 1847, and almost 1,000 in the late 1860’s. The largest growth, however, occurred after 1880, when Antwerp became home to many Jewish immigrants fleeing the pogroms in Russia and the anti-Jewish discriminations in other countries in Eastern Europe. Tens of thousands of Jewish emigrants passed through Antwerp on their way to the Americas (USA, Canada, and Argentina), of them many thousands choose to stay in Antwerp. There were about 8,000 Jews in Antwerp in 1880 and that number doubled itself before 1920. This immigration brought about a significant change in the structure of the Jewish community. From a small community dominated by Dutch Jews, many of them Sephardi, and German Jews, in the early 20th century Antwerp had a large Yiddish speaking Jewish population from Poland, Russia, Hungary, Romania, and Slovakia. Another group of Jewish immigrants arrived to Antwerp from various parts of the Ottoman Empire (Salonica, Turkey) and joined the local Portuguese Jews. As a result of the heterogeneous composition of the Jewish population, Antwerp has had since the early 20th century three separate Jewish communities. The oldest Jewish community started to organize itself in the early 19th century. Following the establishment of the independent Belgian State, the Jewish community of Antwerp has since 1832 belonged to the Consistoire Central des Israelites en Belgique. The first public synagogue in Antwerp opened on Paardenmarkt 83 on September 21, 1832. In 1846 this synagogue was closed and the community opened a new one on the Grote Pieter Potstraat in the building of an ancient church (built in 1433 and turned into a warehouse from 1802 to 1846). At the same time the first mikve (ritual bath) opened in Antwerp. The first large synagogue in Antwerp, built in an “oriental” style to the plans of the Jewish architect Joseph Hertogs (1861-1930), was inaugurated on Bouwmeestersstraat in 1893. This synagogue is still known as the “Dutch synagogue” because it was built by descendants of Jews who came to Antwerp from Holland in the early 19th century. A second Jewish community was organized in 1898 by the Portuguese Jews of Antwerp and it is has since been known as the Jewish Community of Portuguese Rite. Despite the fact that there was a strong presence of Sephardi Jews in Antwerp since the beginnings of the Jewish settlement in the city, this separate Sephardi Jewish community was recognized officially by the city authorities only in 1910. By then, in addition to descendants of the “Portuguese nation”, the community included many Sephardi Jews who came to Antwerp from the Ottoman Empire. Their synagogue was built on Hoveniersatraat according to the plans of the architect J. De Lange and was opened in 1913. The third Jewish community known as Machsike Hadas was organized in 1892 century by Jewish immigrants from Eastern Europe. Their synagogue was opened in 1918 on Oostenstraat and was built to the plans of the architect Jules Hofman in the style of Art Nouveau. The Machsike Hadas community opened a religious school for boys – Jesode-Hatora – in 1895, and acquired a cemetery in the border Dutch village of Putte in 1908. Machsike Hadas Jewish orthodox community was recognized officially by the city authorities in 1910. During the early 20th century another two synagogues were opened in Antwerp: the Eisenmann synagogue on Oostenstraat and the Dutch minyan on Fabriekstaatje, in 1907 and 1919, respectively. Jewish charity organizations started to activate in Antwerp from late 19th century, especially after the arrival of many immigrants from Eastern Europe. The Oesterreich-Ungarischer Hilfsverein (“The Austro-Hungarian Help Union”) was founded in 1887 and it was followed in 1888 by Hulp in Nood (“Help in Emergency”) founded by Jewish women of the Dutch community. The Jewish population of Antwerp continued to grow in the first half of the 20th century and the city became the main Jewish center of Belgium. It is estimated that there were about 50,000 Jews in Antwerp on the eve of WW2, of them probably only around 10 percent were Belgian nationals. During the late 1930’s there were in Antwerp three separate communities that together operated five synagogues and twenty-eight Batey-Midrash, of them the oldest were Feiner (established in 1884) on Leeuwerikstraat and Ahavas Choulom (established in 1888) on Van Diepenbeeckstraat. The majority of batey-midrash, however, were established in the 1920’s and 1930’s and included many that belonged to the various groups of Hasidim that settled in the city: Haside Belz (est. 1929), Haside Gur (est. 1929), Haside Wisjnits (est. 1928), Haside Siged (est. 1928), Haside Kadichah (est. 1919), Haside Czortkow (est. 1928) and others. The Jewish education was supported by a developed network of institutions: several schools were dedicated to Jewish studies only while others included in their curriculum the study of non-Jewish disciplines as well. Yesode Hatorah was established in 1903 as a school for boys continuing an earlier Talmud Torah (opened in 1892). 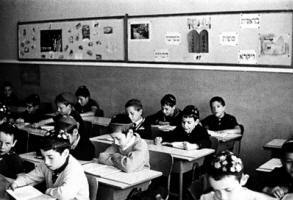 It offered courses in Yiddish and also included a kindergarten. Beth Yaakov religious school for girls was opened in 1937 replacing an earlier school for girls that was established in 1923. Yesode Hatora was associated to Beth Yaakov and together became a prestigious Jewish educational institution whose reputation spread beyond the borders of Belgium. The Tachkemoni school for boys was opened in 1920 and included the study of Hebrew. In addition there functioned in Antwerp another six religious schools, among them a school that was affiliated to the Zionist party Poale-Zion Tseirey-Zion (est. in 1926), and two yeshivas: Etz Haim (est. in 1929) and Yeshivat Shaare Torah (est. in 1930). Although Antwerp had an old tradition of diamond industry and commerce, it was only towards the end of the 19th century and in the first half of the 20th century that the diamond industry turned into a major occupation for the Jews of Antwerp. In the early 1900’s there were already about 700 Jewish diamond-cutters in Antwerp. This development coincided with the arrival to Antwerp of Jewish immigrants from Central and Eastern Europe. The influx of row diamonds from the Belgian colonies in Africa, the trade connections of the Jews and the willingness of the new immigrants to work for lower salaries helped to turn Antwerp into the main world center for the diamond industry. Much of this industry has since been owned by Jews to such an extent that this occupation more than anywhere else in the Diaspora has become a veritable trademark of the Jewish community of Antwerp. However, many other Jews in Antwerp were active as small artisans and merchants, especially in the textile industry. Other Jews were employed within the various Jewish organizations as teachers, rabbis, kashrut supervisors, clerks and an additional ten percent of the work force of the Antwerp Jews were engaged in various liberal professions outside the community. 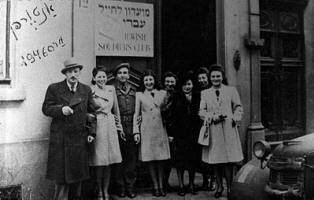 In the late 1930’s there were in Antwerp twenty-two Jewish organizations and associations. They included many Zionist associations, among them the Federation Sioniste de Belgique (est. in 1905), Keren Kayemet LeIsrael, Keren Hayesod, WIZO (est. in 1920), Nachim Misrahi (est. 1922), and Zionist parties – Poale Sion-Tseire Sion (a union of two separate parties founded in 1908 and 1904, respectively), the Revisionist Zionists (est. 1926), Poale Sion-Gauche (est. in 1927). The Yiddish culture and politics were well represented by Der Bund – the Jewish Socialist non-Zionist party, whose local branch was established in 1924 and had many adherents, and the Friends of YIWO (est. in 1928). Agudath Israel started its activities in 1912. Fondation-Frechie, the hevra kadisha (burial society) in charge of the Jewish cemetery in Putte (Holland) was founded in 1884. Additional associations included V.E.V.A. (Verbond voor Economisch Verweer Antwerpen = The Union for the Economic Defense) that was supported by most Jewish organizations; The Association of Jewish Polish Combatants 1914-1918 (est. in 1936); The Union of Polish Jews (1931) and others. There were six professional Jewish organizations in Antwerp during the interwar period: among them Yiddisher Handverkerfarain was founded in 1919 and in 1938 merged with the Yiddisher Handerverkering (est. 1935); a painter’s association; and a shopkeepers’ association. Zionist activities and associations commenced from the early 1900’s with the first Belgian Zionist Congress organized in Antwerp in 1906. The Jewish Territorial Organization founded by Israel Zangwill (1864-1926) had an active branch in Antwerp. here were nineteen Jewish Youth movements active in Antwerp during the late 1930’s affiliated to all political factions in the community. The Zionist movements included Bnei Akiba (est. 1932), Beitar (est. 1926), Bar Kochbah (est. 1920) that turned into Hashomer Hatsair in 1924, Hanoar Hatsioni (est. 1930), Brith Hakanaim (1936), Hehalutz (1929), Benoth Misrahi (1926), Maccabi Hatsair (1931) and others. 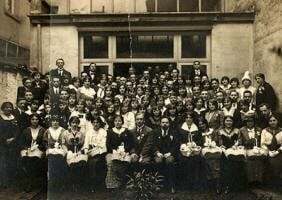 Tseire Agoudah, established in 1912, was the first youth movement active in Antwerp and along with Pirhe Agoudat Israel, established in 1923, and Benos Agoudah, established in 1926 for girls, grouped the supporters of Agudat Israel. Sporting activity was promoted by three different clubs: Maccabi, the oldest, opened in 1920 and had sections for basket-ball, football, swimming, tennis, gymnastics, chess, and bridge. Hapoel belonged to Poale Sion-Tseire Sion party and opened in 1927 with sections for football, table tennis, and chess. The third club, Yask (Yiddisher Arbetersportklub – the Sport Club of the Jewish Workers) opened in 1935 and was affiliated to the Bund party. It included sections for football, tennis, chess, swimming and in addition it had a cultural section as well. The first amateur theater circle started its activities in as early as 1878 and it was followed shortly by another group called De Vriedenkring. In 1912 the Yiddisher Progresiver Dramatisher Klub was founded. Antwerp was frequently toured by renowned Jewish musicians and performers as well as distinguished Jewish theater companies from other countries, like Habimah of Moscow, Die Wilner Truppe of Vilna, and Jiddisches Kunstthater of New York. Hatikwah was the first Jewish weekly in Belgium published in Antwerp by the Agudath Zion association in 1905 and until 1914 it appeared in German. During the first half of the 20th century more than fifty various Jewish periodicals, the majority in Yiddish and a few in Dutch, French, and Hebrew were published in Antwerp. On May 10, 1940, Germany attacked neutral Belgium. On May 28, Belgium surrounded and was occupied by the Nazi Germany. Fearing the Germans, the majority of the Jewish population of Antwerp fled to other regions in Belgium or to France. As many of the Jews living in Antwerp and indeed in Belgium were not Belgian nationals, they were initially refused entry into France. Nonetheless, many did manage to enter France taking advantage of the huge waves of refugees and the general chaos that prevailed in northern regions of France before its defeat in June 1940. Contrary to what happened in Eastern Europe, the German occupation forces did not start their anti-Jewish persecutions immediately. The inability to find shelter elsewhere, especially not being able to cross the sea to England, as a handful of Jews from Antwerp did before the German invasion, combined with the apparent correct attitude of the Germans, convinced about 25,000 Jews to return to Antwerp. But on October 1940, the Germans changed their policy and gradually introduced a long series of anti-Jewish measures. Some 13,000 Jews were registered in a special Judenregister; they were forbidden to leave their homes from evening till morning, enter public parks, and Jewish owned businesses were marked with signs in Flemish, French and German. Between December 1940 and February 1941 more than 3,000 Jewish immigrants that entered Belgium after 1938, were deported at the order of the German army from Antwerp to a rural area in the Belgian province of Limbourg. More than in other cities of Belgium, in Antwerp the Germans received the support and collaboration of local pro-Nazi and anti-Semitic parties and groups. On April 14, 1941, a pogrom was organized against the Jews of Antwerp by local pro-Nazi groups, especially the VNV (Vlaams Nationaal Verbond), De Vlag, and De Algemeene SS-Vlaanderen, with the assistance of the German forces. The Van den Nestlei and the Oostenstraat synagogues were looted; many Jewish-owned shops were burnt. The municipal council of Antwerp assumed responsibility for the attacks and decided to refund the Jews for the damage, but the Germans blocked the implementation of the decision. On May 1942 all Jews were compelled to bear the yellow-star badge. During the summer of 1942 mass arrests of Jews were initiated all over Belgium. A transit camp was opened at Mechelen (Malines) from where the arrested Jews were deported to the Nazi death camps in Central and Eastern Europe. On Friday night, August 28, 1942, most Jews in Antwerp were arrested and deported. The remaining ones who held Belgian citizenship or belonged to the Judenrat (established in November 1941 and called Association des Juifs en Belgique – AJB) were arrested at their turn one year later on September 4, 1943. By the time Antwerp was liberated by Allied troops on September 4, 1944, only about 800 Jews had managed to survive in the city with the help of members of the local population, for the most part devout Catholic individuals and activists of the Communist-dominated Resistance. Members of the pre-war Zionist Youth Movements continued their activity in the underground and helped smuggle Jews into Switzerland and Spain during 1942-1943. The annihilation of the Jewish community of Antwerp was almost total. There were a series of factors that facilitated the destruction, among them the fact that the majority of the Antwerp Jews were not Belgian nationals, most of the Jews in Antwerp were concentrated in distinct neighborhoods, and especially because the support received by the Germans from local anti-Semites was stronger than in many other places in western Europe. Moreover, the local Belgian authorities apparently showed almost no resistance to the Germans and thus enabled them to carry the mass deportations, while the effective assistance to Jews from the local population was weaker than in other cities in Belgium. Jews from Antwerp who fled to France or other regions in the German occupied Europe suffered the same fate and the majority perished in the Holocaust. HISO (Hulp aan Joodse Slachtoffers – Help for Jewish War Victims) was the first Jewish organization that started to operate in Antwerp immediately after the liberation with the aim of aiding the survivors and the few Jews who returned to the city from the deportation. The rebuilding of the Jewish community began already in 1946. The Synagogue of Van den Nestlei, built in 1928, was renovated in 1954 and has since been known as the Romi Goldmuntz Synagogue. It belongs to the Modern Orthodox stream and serves as the main synagogue in Antwerp. The Jewish community grew again quite rapidly during the 1950’s and reached about 10,000 members in the early 1960’s. Many of them were Holocaust survivors and their descendants who were joined by immigrants from Eastern Europe, mainly from Hungary, Romania, Slovakia, and Poland. For the most part these new immigrants belonged to various Hasidic groups; their impact to the Jewish life of Antwerp has been strongly felt especially as they have continued to observe a traditional Jewish way of life typical of the small towns in pre-Holocaust Eastern Europe. Unlike the situation before WW 2, they all received Belgian citizenship, apart for a few who preferred to maintain their status of refugees. 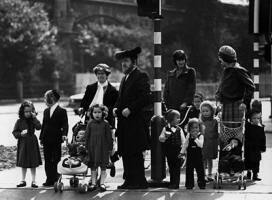 Since the early 1960’s Jews from other countries as well, including Israel, settled in Antwerp. In the second half of the 20th century the diamond industry became the main occupation for the Jews of Antwerp. Most of them are either high skilled artisans who specialize in executing the most professional stages in the process of turning row diamonds into high quality precious stones or merchants who are connected to the global network of diamond trade. The diamond bourses of Antwerp are located inside the Jewish districts of the city; they close Friday afternoon before the unset of the Shabbat and are deserted during Jewish holidays. After the 1980’s, though, changes in the world diamond industry brought about a decline in the importance of Antwerp with the result that the influence of Jewish-owned companies on the market has diminished. Due to its large concentration of orthodox and ultra-orthodox Jews who maintain a very traditional Jewish way of life, Antwerp has many times been nicknamed the last “shtetl” in Western Europe. Yiddish is widely spoken even outside the homes and also by Jews who were born in Belgium. In the second half of the 20th century Flemish has been increasingly adopted by the Jews of Antwerp, many of which also speak French and Hebrew. Many Jews in Antwerp live in Jootsewijk, a district around the Pelikanstraat, not far from the Central railway station. During the early 2000’s the Jewish population of Antwerp was estimated at about 18,000, the great majority of them belonging to the there separate Jewish communities in Antwerp. The ultra-orthodox Machsike Hadas (Israelitische Gemeente Van Antwerpen – Machsike Hadas) is home to most Hasidic groups in the city including the Belz, Gur, Satmar, Czortkow, Lubavitch, and Vizhnitz Hasidim. 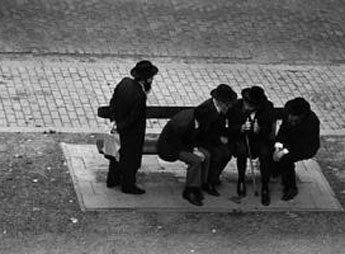 Antwerp is also the home of a new Hasidic group that was formed after WW2 by the followers of Rabbi Yitzhok Gvirzman (1881-1976), also known as Reb Itzikel (or Yitzkel), a Galician-born descendant of the Pshevorsker dynasty of rabbis, who immigrated to Antwerp in the 1950’s. The Hasidim comprise about forty percent of the Jews of Antwerp, but their presence is strongly felt . The members of the Shomre Hadas community (Israelitische Gemeente Van Antwerpen – Shomre Hadas) have a modern orthodox Jewish way of life. The Sephardi community of Antwerp is known as the Jewish Community of Portuguese Rite (Israelitische Gemeente van de Portugese Ritus). The three communities are members of the Central Jewish Consistory of Belgium, the main Jewish umbrella organization in Belgium. It is estimated that about twenty percent of the Jews in Antwerp are not affiliated to any of the religious communities in the city. Each community has its own synagogues, batey-midrash, and kosher slaughterhouses. There are two ritual baths, one for men and a separate one for women. There are about thirty synagogues and prayer houses in Antwerp, most of them located within the neighborhood of Jootsewijk. 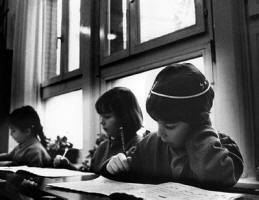 Jewish education is provided by four main Jewish schools in Antwerp: Jesode Hatorah (for boys), Beth Yaakov (for girls) – both belonging to the Machsike Hadas community, Yavne, and Tachkemoni of the Shore Hadas community, in addition to other smaller private religious educational institutions that include Yeshiva Etz Haim and Yeshiva Tichonit. More than eighty-five percent of the Jewish children in Antwerp attend Jewish schools, one of the highest rates anywhere in the Diaspora. Student and youth organizations include Agudath Israel, Bnai Akiva, Hashomer Hatzair, and Hanoar Hazioni. A number of welfare Jewish organizations are active in Antwerp, among them the Federation of Jewish Women’s Associations and the Jewish Welfare Organization. The community maintains two senior citizen homes and a hospital. Keren Hayesod, WIZO, Keren Kayemet, and the Zionist Federation are the main Zionist organizations in Antwerp. Belgisch Israelitisch Weekblad (“Belgian Jewish Weekly”), the largest Jewish newspaper in Belgium is published in Antwerp. The Romi Goldmuntz Center serves as the stage for many cultural events of the community, including lectures, music and dance performances and it also shelters a Jewish library. The Royal Maccabi Sports Club is the main Jewish sport center in Antwerp. There have been a number of anti-Jewish attacks in Antwerp in recent years. The Hoveniersatraat Synagogue was the target of a terrorist attack in 1981. The rise of the right-wing Vlaams Belang (formerly called Vlaams Blok) party encouraged an increase in the intolerant atmosphere towards non-European immigrants in Belgium; occasionally members of this nationalistic party expressed anti-Jewish opinions as well. The Forum of the Jewish Organizations in Flanders, established in the 1990’s, undertook the task of informing the public opinion about the dangers of the newly emerging anti democratic and anti-Semitic currents in the Belgian society. In the early 2000’s there was an increase in physical attacks on Jews and Jewish property especially by members of the Muslim immigrant community of Antwerp. ‘Flower Day’ of the Jewish National Fund, Antwerp, Belgium, 1914.